Have you been arriving late on your way to school or the office? Do you routinely miss business meetings or dinner dates? Not surprisingly, all of us do because people are always caught in monstrous traffic every single day. What used to be an easy alibi has now become an inescapable reality. No one is spared from involuntarily wasting precious time traveling the metro streets. In an Inquirer report last July 2013, the country is losing as much as P2.4 billion a day, according to a study by JICA (Japan International Cooperation Agency). 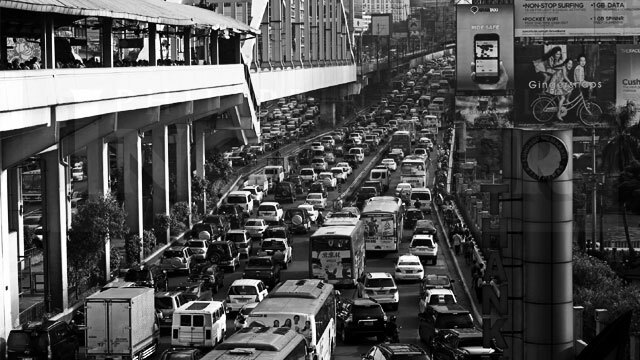 The list of factors is endless—lack of additional roads, heavy volume of vehicles, vehicular accidents, clogged alternate routes, road repairs, sidewalk vendors, illegal parking, illegal terminals, undesignated bus stops, undisciplined drivers and pedestrians. And worst of all, inefficient traffic enforcers and management. Throw "kotong cops" into the mix and it's utter chaos. Authorities have been coming up with all sorts of suggestions to decongest traffic. Some are quite good, but most are ridiculously thought-out, making guinea pigs out of motorists. Things like the Number Coding Scheme, the Numbered Bus Stops, and the U-Turn Slots—the latter seemingly causing more harm than good. In hindsight, new roads and railways should have been constructed earlier as planned. Now we are all racing against time trying to find a quick fix to a problem that has become a hellish nightmare. Can somebody just wave a magic wand? All of them unanimously agree that there is no immediate solution to traffic congestion. But the primary goal is in transporting as many passengers as possible through an efficient mass transit system, hence the need for the improvement of MRT trains in Metro Manila, and the modernization of the Philippine National Railways plying provincial routes. 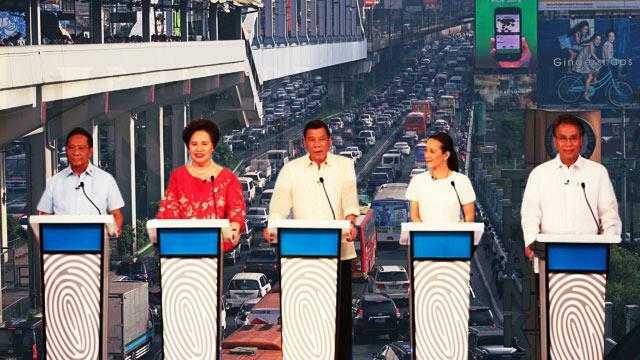 Aside from train improvements, Duterte and Poe are also considering the development of waterways and subways, respectively, in alleviating road traffic. Duterte's sights is zeroed in on Pasig River, where previous administrations have tried but failed due to poor implementation. Meanwhile, Poe remains confident that building subways would speed up travel time. 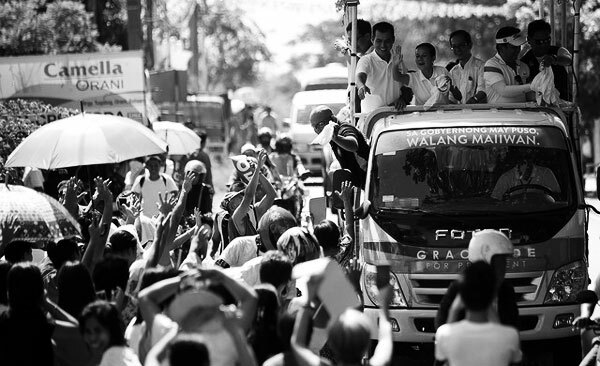 Similarly, Binay and Santiago are setting their eyes on improving the conditions of bus companies. Binay plans for an efficient BRT or bus rapid transport—each lane "moves 45,000 passengers per hour" compared to a car's 2,000—in Metro Manila for quicker and safer travel. Changing the existing boundary system to a fixed regular salary system will lessen the waiting time of the commuting public. And if that's not enough, Defensor-Santiago urges large malls to provide adequate bus stops for easy pick-up and drop-off. Roxas reminds other candidates that their mass transit proposals are already currently taking place, and that he "will continue to improve our mass transportation systems and ensure that they are of sufficient capacity and world-class quality." There are a number of vehicles in bad condition but are still being driven by motorists. Duterte is keen on phasing out these old, dilapidated vehicles that, he believes, are only contributing to the already worsening traffic conditions. 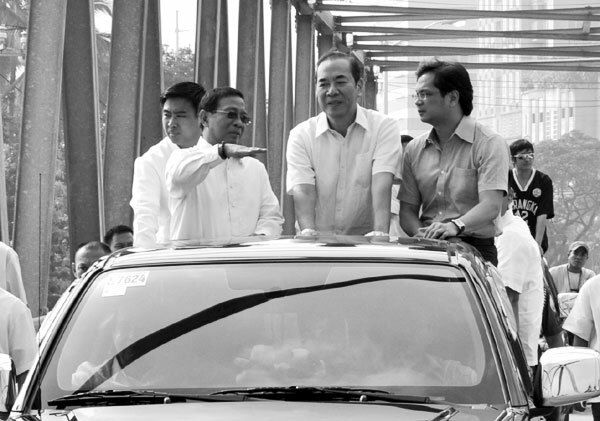 Poe complemented this with the removal of all colorum vehicles as well, which take revenue away from legal franchisers. Incidentally, Roxas wants a refinement in the bus franchising. 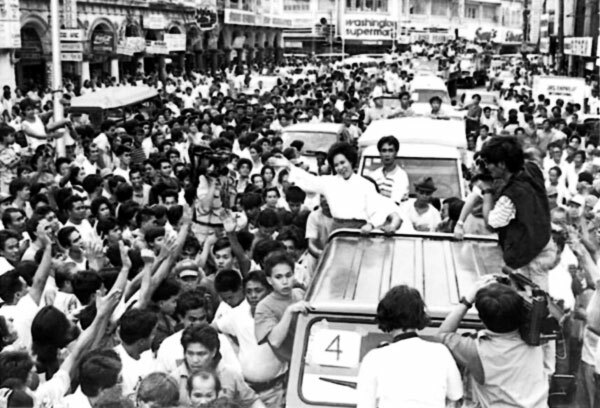 Removing unworthy vehicles off the road is one thing, but Poe surmised that road widening would also help in decongesting traffic. With all the road constructions come traffic rerouting that's why all road projects should meet their targeted deadlines to avoid prolonged agony for commuters—a plan both Poe and Binay shared. 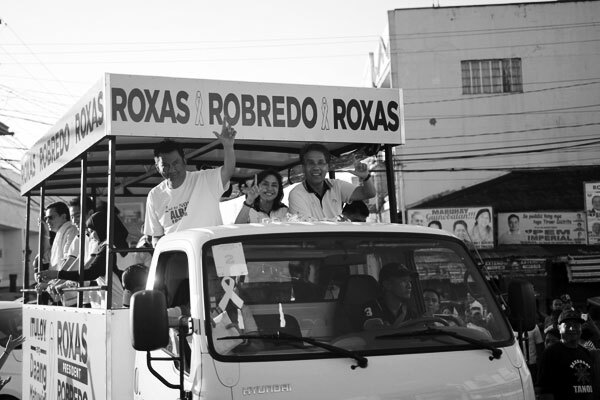 Likewise, Roxas favors more road constructions. Again, Binay and Poe had same views in designating a competent traffic head or a traffic terminator who, as the latter described, would oversee all road constructions. Binay added that there will be better traffic management if the DOTC would be split into two—the Department of Transportation and the Department of Communication. On the contrary, Roxas shrugs off Binay's plan, saying, "Ako, ibabalik ko yung transport at yung DPWH, yung gumagawa ng kalye at yung gumagawa ng tren, dapat...isang pamunuan, para coherent ang mga plano." Basically, Santiago shares similar proposals with the other candidates. But she added stricter measures should be adopted in applying for driver's license. Furthermore, she wants to "impose, with legislative support if necessary, a progressive taxing scheme for the purchase of more than one car per family, as well as regulations for car loans." Roxas reveals his long-term plan of developing the countryside to discourage people from "moving out of their original hometowns and into the cities to find better opportunities for employment and success." 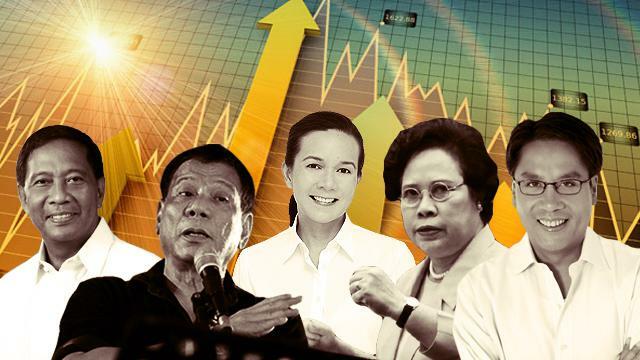 Poe has a similar vision of "encouraging investment and job creation outside of major cities." Similarly, Santiago plans for developing a new capital city in the Clark area. Binay has the vision of transforming Manila "into a modern city and paradise both for Filipinos and tourists alike." 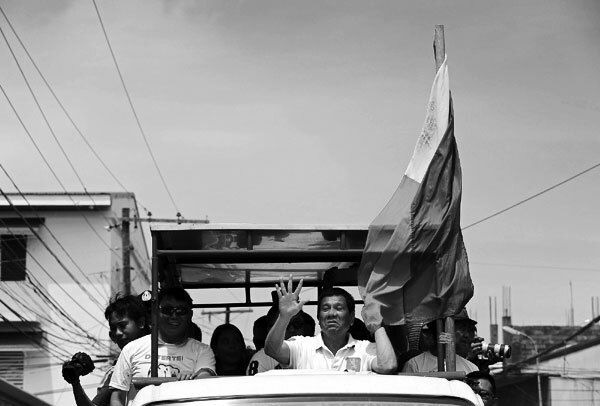 He even plans to tap "international talent and expertise on crafting solutions for the Philippine problem." Click here for the rest of FHM's "Your President's Plan," where we discuss each candidate's plan regarding China, crime, and the economy.